Many thanks to Helen Paterson, one of our accredited trainers for this fascinating blog. Now that Talking Mats is accessible in a digital format, the Talking Mats team are often asked ‘Can it be used on an eye gaze device?’ . Of course, for those who use eye pointing reliably, they can use a standard Talking Mat, but there are those individuals with whom we work with who may want to use their eye gaze device to use a Talking Mat, and who find the digital format more accessible. We would suggest that this is only done with a client who is already familiar with eye gaze , due to the extra effort required both to use eye gaze and to make decisions when using a mat. There are many other access methods with which you could use and access Talking Mats Pro, such as a head mouse, chin joystick or touch screen, but for this blog we will focus upon eye gaze. Here’s how we made it possible, and I am sure there may be other ways which we would love to hear about! To use Talking Mats Pro directly using eye gaze the person really needs to be calibrated on a device, and they require a level of calibration that is good enough that they are able to access a mouse emulator or Gaze selection on Tobii. You must ensure that the mouse emulation or Gaze selection features are set up and the person understands what the features are and what they mean e.g: left click, drag and double click. Open up Talking Mats pro on your account. You will need to select the topic, topscales and symbols for your client, as this will make it easier with less work for your client, although this is something you would do anyway as the person facilitating the mat. Now go through the question and the topscales as you usually would and explain them to your client. Select the first symbol and place it on the mat where they can see it. Mouse emulation: In mouse emulation mode, the user is emulating and controlling a mouse pointer on the screen. This function is available with software such as: Tobii Gaze Interaction in Mouse Emulation Mode (shown above), Alea Intelligaze, Eye Tribe with Dwell Clicker, Tellus 4 with TM4 eye tech, or the Windows App within the Sensory Software’s The Grid 2 FastTalker2 user. Client first needs to open the mouse function menu by fixing his or her gaze on the small grey icon which will open the mouse menu. Then the client will select the symbol s/he wants to move by fixating on it. They will then fixate on a point to ‘drop’ it. 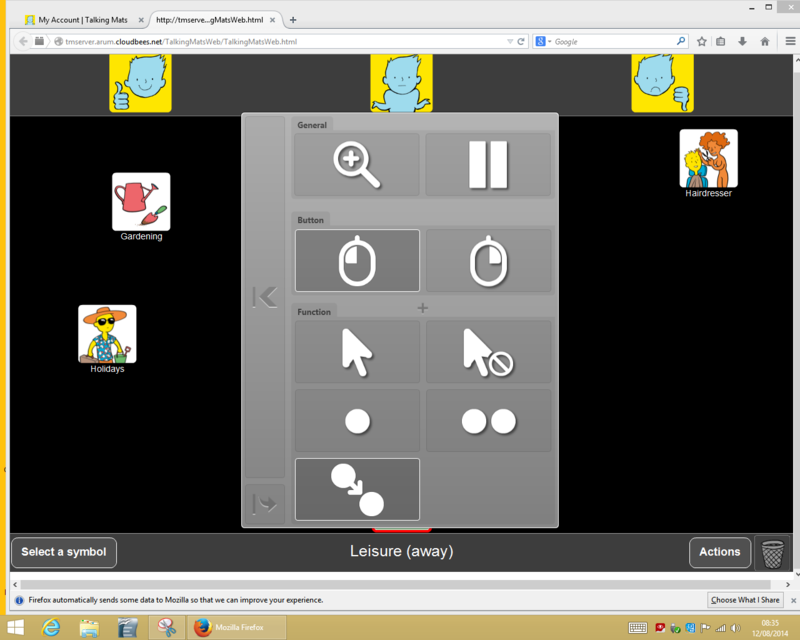 With Gaze selection (Tobii only) the user can control a Windows desktop with a two step selection method. The first step involves selecting the desired task from the taskbar on the right of the screen. The person looks at it until it changes to white. The person then looks at the part of the screen where they want the task to take place. They then look where they wish to place the symbol. This does require some more thinking on the side of the client as they need to look to where they want it to go and they are not just dragging it as they are in mouse emulation mode. For individuals who do not have a calibration good enough to use mouse emulation or gaze selection, it is a little more complex. A Talking Mat could be emulated from software such as The Grid 2 or Communicator, but it would not involve the software from Talking Mats Pro or dragging of symbols and moving them to where the person wants them to go. 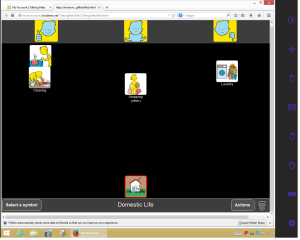 This entry was posted in AAC, App, Blog, Communication difficulties, Digital Talking Mats, Participation, Personalisation and tagged AAC, App, digital, Participation, Personalisation, Talking Mats on September 23, 2014 by Joan Murphy. Thanks to Anita Devi,Education Consultant, for her helpful contribution to this blog. The implementation of the recent SEND reforms in England requires interdisciplinary teamwork. Integrated assessments will now be carried out in cooperation with the young person and the parents. Capturing the child’s own perspective and recording their views, interests and aspirations is now a statutory requirement. The principles of the SEND Code of Practice state that practitioners should encourage the child or young person, and the child’s parents to participate as fully as possible in the decisions affecting their lives and use a common language to shape educational and other outcomes. 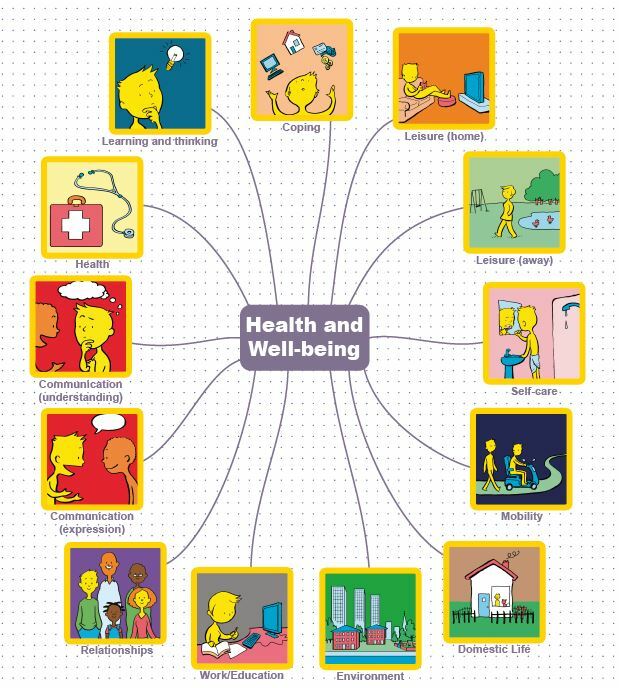 Talking Mats has produced a practical and creative resource – “Consulting Children & Young People” that helps practitioners to ensure that they take account of the SEND Principles at all stages of the assessment process and development of the EHC Plan. We recognised the need to develop a tool that would give a holistic picture of how a child or young person feels about their lives at home, at school and in their communities. Having a visual framework means that there’s more time for reflection. You can help young people to see their personal strengths and abilities and take time to consider what their problem areas are. 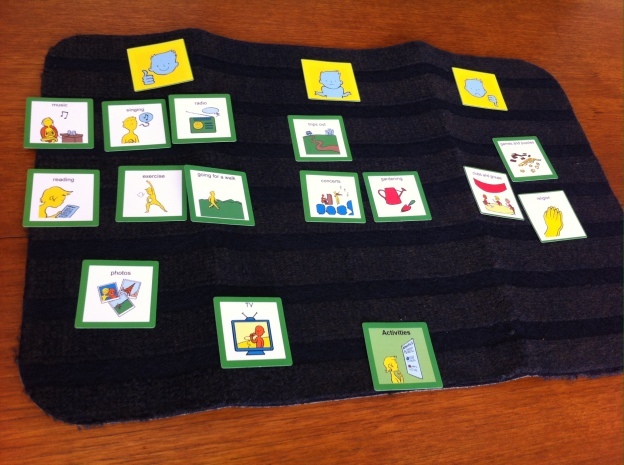 Talking Mats gives greater choice and control about what kind of intervention is required to support them. Awareness – an introduction to the Talking Mats framework and the development of the CCYP resource. Specialist – In depth training which allows the practitioner to train others in their organisation. A child centred approach to joint decision making. Read Part 2 of this blog next week. Thanks to Helen Beltran for this thought provoking blog. I am an Accredited Talking Mats Trainer and have just finished a great week of training in my local area, Inverclyde, Scotland. This was the first time I had given out symbol sets to everyone who completed the training. What difference did it make? Everyone was able to see the symbol sets during the training and was really positive about the images and the design. I was concerned at the time that this would stop them really engaging with the process and individualising their mat. I was so pleased when they came back with videos that showed that they had selected the most appropriate options for their communication partner, they had removed those that were too abstract, they had thought about using photos, they had added symbols they had produced themselves. They had made the resources their own! We talked about this as a group and all the participants felt that the symbol sets were going to allow them to get going with Talking Mats. They would then develop their bank of symbols, by making their own and buying further packs. Some participants told us that they felt having the symbol sets was allowing them to bring supportive colleagues on board who had not yet done the training and was combatting the negative attitudes of the vocal few who had the ‘not more work for us to do’ attitude! They left with their symbol sets – full of ideas, not just about Talking Mats but about offering choice, hearing the individual’s voice, reducing vulnerability, relationship building and empowerment. It has often struck me that some people are very much at home making picture resources and making their communication more visual, while others find it a real challenge. Is it reasonable for us to expect everyone to produce their own resources from scratch? Is the barrier to the use of visual communication the making of the resources, rather than the motivation to use them? On the other hand, is the making of the resources the only way to make sure that the supports meet the individual’s needs? What about the costs involved in buying in? Do those who are embracing visual communication need help with resources in order to spread good practice? This entry was posted in AAC, Blog, Personalisation, symbols, Training and tagged AAC, Personalisation, symbols on September 5, 2014 by Guest Blogger.